Glucosamine/MSM combines two of the most popular natural agents used in joint health research - in the forms and doses validated most likely to be effective. 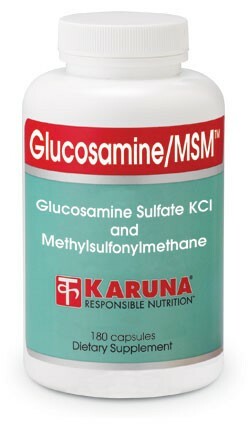 Glucosamine sulfate (in the sodium-free KCl form) has earned its popularity: many clinical studies have proven its bioavailability and chondroprotective activity. MSM, also known as "DMSO2", is a crystalline DMSO-like compound that supplies sulfur - a key nutrient for the growth and maintenance of connective tissues. Evidence is rapidly accumulating to justify professional acceptance of MSM-containing products. The Glucosamine/MSM combination makes for a rational, economical and powerful choice for supporting long-term, comfortable function of joint structures. Refer to About...Glucosamine and About...MSM. Recent human research has validated the synergistic action of glucosamine/MSM combinations to promote joint health (Clin Drug Invest 2004;24:353-63). Suggested use for adults:Six capsules daily in divided doses, taken with meals, or as directed.